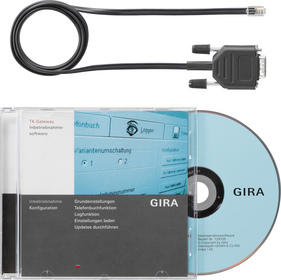 For programming the DCS-TC gateway with a PC or notebook, consisting of a programming cable (RS 232 to RJ11) for connecting the DCS-TC gateway. Settings of the basic configurations. Phone book function with the ability to enter up to 50 devices with names and 2 telephone numbers. Log function for logging bus activities.